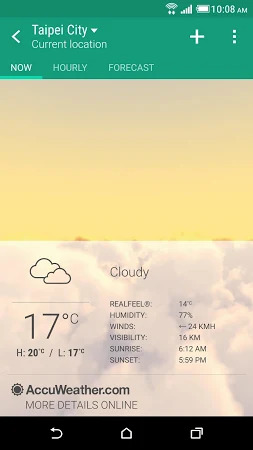 HTC Weather provides the current conditions in your location, as well as detailed information about cities around the world. Find out the temperature in Taipei, the humidity in Halifax, the real-feel in Rome, the wind speed in Wichita, the visibility in Vienna or the sunrise and sunset times in Saigon. This download is completely safe. 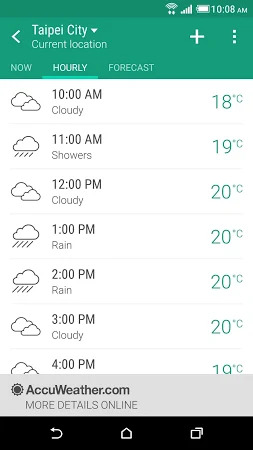 HTC Corporation is the official developer of this application which can be found in the Weather category. The app has the average rating 3.9 on Google Play. 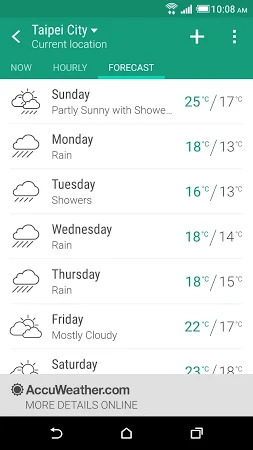 The most recent update of the tool was launched on Aug 10, 2017 and HTC Weather has been installed by over 10M users. The statistics demonstrate that this application is popular mostly among HTC and Samsung users. You can get the setup package of HTC Weather 8.50.935520 for free and check out users' reviews on Droid Informer. The app works fine on Android 4.4 and above. Users leave reviews pointing out that there are several advantages, they are a nice UI and auto updates. In users’ view, HTC Weather features such a drawback as high battery usage. WxSat displays and animates full-resolution, real-time weather satellite data. Elegant and essential compass rose. The skin for Weather Notification. Convert wind speed easily with Marine Wind Calculator! The brief widget which can display the time of all parts of the world. Accurate and local forecasts for locations worldwide.
! Občasno prihaja do izpada pri prenosu žive slike vendar to ni napaka aplikacije!